Many of our clients are curious about the basic workings of a lawsuit in Georgia. Lawsuits generally follow the same path to trial: filing a complaint, service of process, receiving an answer, discovery, and trial. Summons and Complaint: If you have a legal issue or complaint the first document that is drafted is known as the complaint. The complaint spells out what the defendant did wrong. The sheriff’s department will usually serve the defendant with a summons which notifies the defendant of the lawsuit and the complaint which tells the defendant what the lawsuit is about. Answer and Discovery: The defendant will typically have 30 days to respond to the complaint. This response is called an answer. Once the answer is filed, approximately 6 months of discovery takes place where each party asks questions, requests documents, file motions and conducts depositions. At the conclusion of discovery the judge will put the lawsuit on his or her trial calendar for either a bench or jury trial. Trial: Generally, the trial will be in front of a jury. Due to the backlog of cases in our court system today a lawsuit may take months or even years from the time of the filing of the complaint to the actual jury trial. 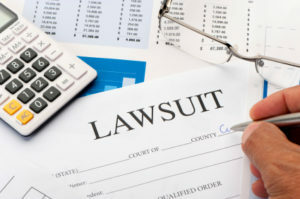 Hall County Business Litigation Lawyer in Gainesville, GA explains the basics of a lawsuit. If you have any questions regarding lawsuits in Georgia, or any other question related to filing a lawsuit, please Call or Email the Gainesville, GA Lawyer at A. Bishop Law, today for a free and confidential initial consultation. About the attorney: Anne Bishop is an attorney with A. Bishop Law in Gainesville, Georgia. The law office of A. Bishop Law offers a variety of business services and can assist clients throughout Northeast Georgia including: Hall County (Gainesville, Oakwood, Flowery Branch), Lumpkin County (Dahlonega), Gwinnett County (Buford, Sugar Hill, Lawrenceville), Habersham County (Demorest, Cornelia), and adjoining counties.